One day adventure tours to Churchill to see the Polar Bear Safari. Starting from $1850. Explore the skies at the edge of the Earth over Fogo Island, Newfoundland with cosmologist-in-residence Tom Vassos alongside Community Hosts that have used the stars to navigate the waters of the North Atlantic for decades. Experience the Aurora Borealis from Yellowknife. This is a once in a lifetime opportunity to view the northern lights from the air. For the first time ever in Canada, this one-of-a-kind experience will offer spectacular and unmatchable views of high altitude aurora at 36,000 feet. CALLING ALL FOOD FANS ! Discover the incredible tastes of Ireland on an eight day tour filled with the flavors of farm-to-table cheeses, freshly caught seafood, world-famous stouts, and more. 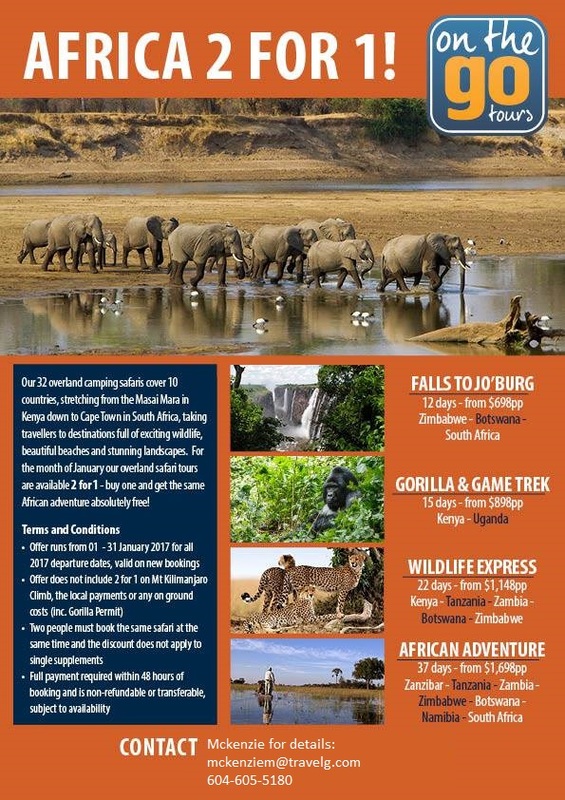 Do you want to go on a camping safaris in Africa ? 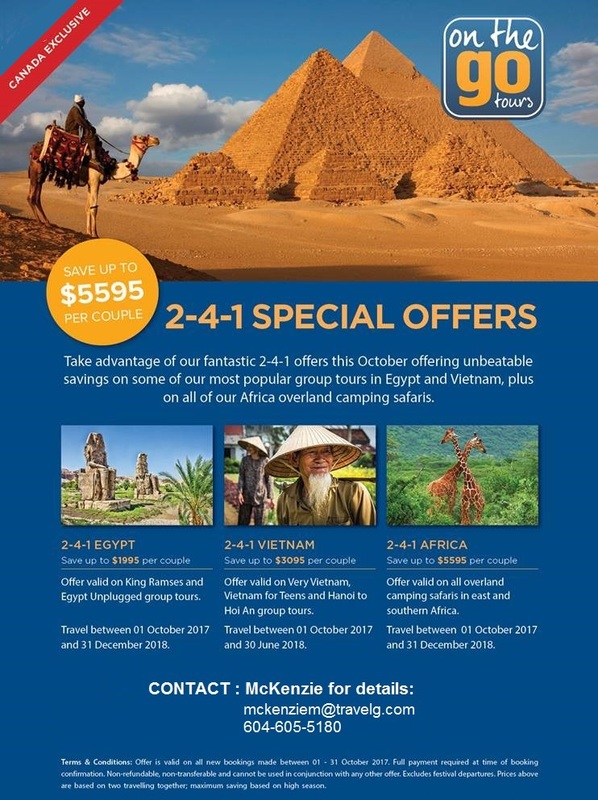 For the month of Jan. select tours are 2 for 1. Discover the extraordinarity country of Rwanda and the Mountain Gorilla's. Are you ready to experience a vacation where your senses come alive? Savor the smell of the wines, the views of golden hills dotted with California live oaks rising above trellised grapevines and the unique tastes of this regions specialized food and wine. With many of Burma’s highlights situated on the winding Irrawaddy River, cruising is a wonderful and luxurious way to experience them. From the ancient capital of Mandalay to temple studded Bagan. Sure you've imagined a special dinner at the Harbour Center (revolving restaurant) or the restaurant right on the water, but what about something extraordinary? Dinner in a aerial cable car while making your way to the top of a mountain. This is truly a different way to discover Switzerland! Marvel at spectacular scenery from the first-class carriages of the Swiss train network, with rides on the GoldenPass Panoramic train, Glacier Express, Bernina Express, and the Gornergrat open-air cogwheel train. This inn is not just a hotel but an exercise in love and sustainable community living. Drive one of our boat after a simple, hands-on lesson. This Canadian tour, designed by Canadians, for Canadians, to pay tribute to all who served their country and particularly to those who gave their lives. Visit museums, memorials and special sites that commemorate Canada's contribution in the Great War including Canada’s inspiring Canadian National Vimy Memorial.